Secure Data Technologies is proud to partner with Big Switch Networks, to help you find the perfect stress-free next-generation data center networking solutions for your growing business needs in the St Louis area. By combining industry standard switch hardware with intelligent Software Defined Networking control software, Big Switch is delivering next-generation data center networking fabrics for the world’s most advanced data centers looking to achieve unmatched degrees of network automation at cloud-competitive price points. 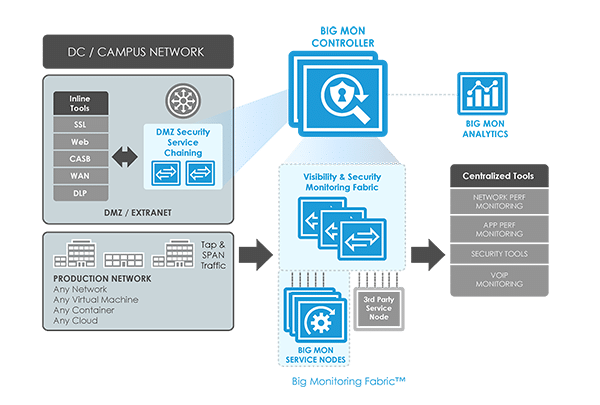 Big Switch enables data center transformation and accelerates business velocity by delivering a responsive, automated, and programmable software-defined networking (SDN) fabric-based networking solution. Traditionally, the network has been viewed as the barrier to data center transformation with cumbersome management paradigms and inflexible hardware choices that are increasingly unable to keep up with the pace required of businesses today. By harnessing the power of software-defined networking technology and coupling it with industry standard hardware, Big Switch Networks advances business competitiveness with an agile, flexible, intelligent and secure solution so IT organizations can experience a true Next-Generation Data Center Network. 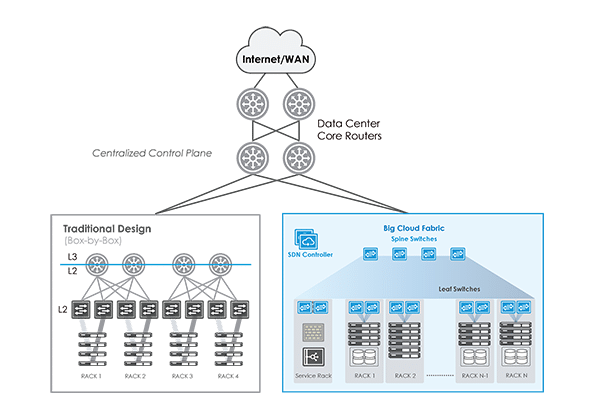 Big Cloud Fabric delivers next-generation data center networking — the promise of hyperscale agility, economics and operational simplicity delivered to OpenStack Platform clouds or VMware virtualization environments. 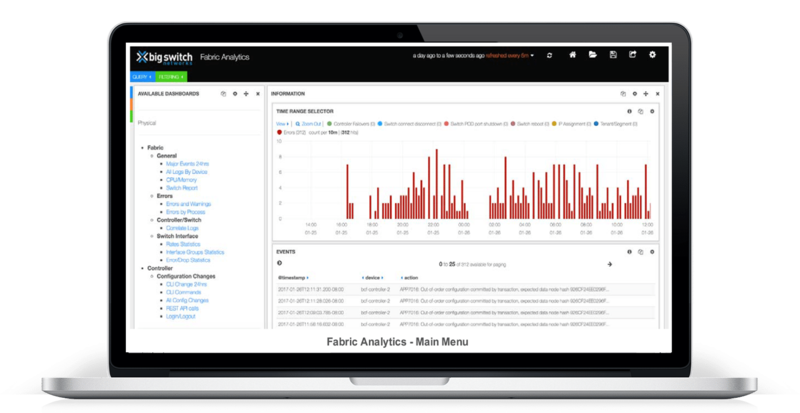 Big Cloud Fabric is the industry’s first leaf/spine SDN fabric to support open networking switches. 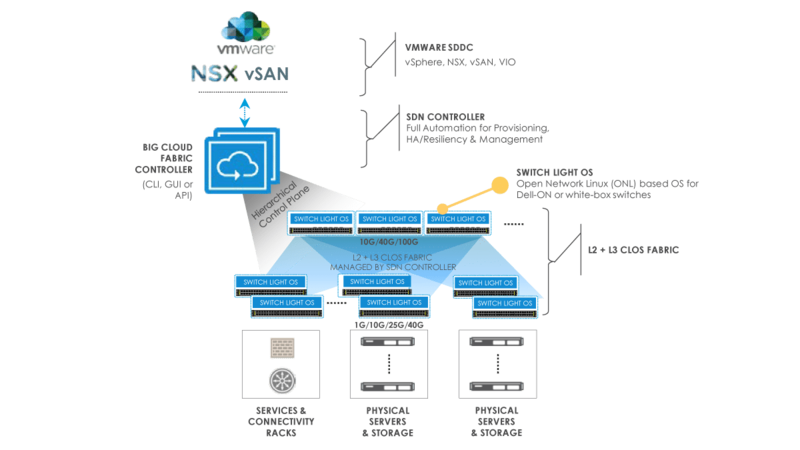 In OpenStack environments, the Big Cloud Fabric controller acts as a single pane of glass for network provisioning, troubleshooting, visibility and analytics of the entire physical and virtual network environment, delivering tremendous improvements in network agility, automation and operational efficiency.